Dorm Co. Tip: Work out without worry of fall out! Everybody knows that going for a run is much better with music. With the right song playing, you can feel like you're in one of those intense Nike commercials. When really you're only a half mile from your college dorm room moving at a less than impressive pace. Whether you're a collegiate athlete or just a casual college gym goer, our Runner's Sport Hooks Noise Reduction Earbuds will help get you through your college workout. Nothing is worse than starting a run and continually needing to stop your headphones from falling out. Luckily, our college headphones have adjustable hooks that won't fall out when you're running from your college dorm room to the gym. Okay maybe you won't be running to the college gym, but no college student wants loose headphones! The braided cable cords of our headphones add both style and durability to our college workout must have supply. 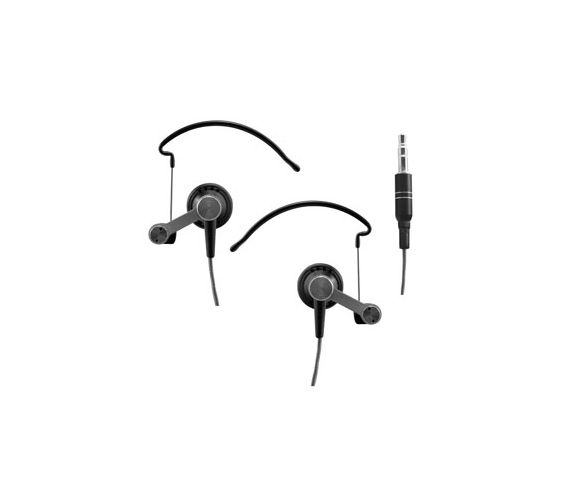 Made with metal construction, our college headphones will stay in your ears without hurting them. 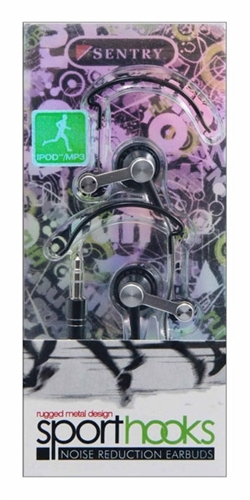 Runner's Sport Hooks are also great to have in your college survival kit for those mornings when you need to sprint to class form your dorm, but still want to listen to music. Even if you don't have practice for two hours everyday, our college Noise Reduction Earbuds will make it easier for you to walk or run fall-out free.